Two free gardening classes are back at MLK Park this spring and summer, led by friendly Hennepin County Master Gardeners. Vegetable Growing Basics is for beginning gardeners or anyone needing a refresher class. 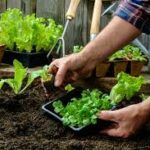 Master Gardeners will teach you how to plan and plant a vegetable garden, as well as how to care for your veggies until harvest time. Bring questions from your home garden to this class. The class is hands-on, and meets outdoors at the raised garden beds at the northwest corner of MLK Park, 40th and Nicollet. Meetings are held from 6:30 to 8 PM on four consecutive Tuesdays, April 3rd through April 24th. Classes are free and open to adults 18 and older, but interested teens are welcome to attend with a parent. or, phone MLK park at 612-370-4908 and tell them you are registering for Vegetable Growing Basics. You will need to give your name, address, phone number, and email address, if you have one. Donation Gardening will meet on Tuesday evenings, May 1st through September 11, from 6:30 to 7:30 PM, at the MLK Park outdoor raised garden beds. Come as often as you can! Note: MLK Park is also considering offering food preservation classes in the fall. If you are interested in this, please contact KFNA and let us know so we can help in setting up this course offering. You can reach KFNA at info@kingfield.org or 612-823-5980. Veggie Basics is sponsored by The Minneapolis Park Board, Kingfield Neighborhood Association, and the University of Minnesota Extension Master Gardener Program in Hennepin County.